Ever have trouble “turning off” (or inhibiting) your back while laying on the ground? Some technique or sensory integration in which they can “let go” of that feeling for excessive extension through their lower back. Years ago I would have said all they would need is to improve soft tissue quality in their back muscles, but at some point they will need to learn how to move without reverting back to that extension based pattern. The brain can self-organize, and if the paraspinals or quadratus lumborum(s) are not being used, what else will be called upon? I mention integration and “sensory experience” for a few reasons. I’m of the belief that, other than structural or patho-anatomical issues (disc issues, structural scoliosis, etc. ), identifying reasons that support an aberrant extension based pattern will help us understand the factors involving this issue. Does your work scenario involve multi-variable environments? Do you have healthy spinal positioning during commutes to and from work? What is your form of communication during work (phone, headset, Skyping, etc)? I point to these areas because I want to emphasize that low load, long duration over a number of years, especially in a specific posture such as work stations, can impact one’s everyday static and dynamic posture. So something that is interesting to consider is how every individual will have different interpretations of how to perform certain tasks. To be more specific, observe what happens when you see 10 different people hanging out waiting for a train (barring staring at their phones) – weight will be shifted from one leg to the next, thoracic positioning will be different, heads will be rotated to and fro. To be clear, there is no right or wrong posture. I believe the best definition of posture is understanding how dynamic something like standing can be – “standing” can change if you’re standing on a train actively fighting acceleration and deceleration of movement of the train, “standing” will be different based on whether or not you are anxiously waiting for a cab, Uber, or if you aren’t anxious at all. And, I suppose your standing posture can also be reflective of your work posture if you stand for most of your day as well. With that said, the same process of movement variability can apply in this instance for standing – you can depend on your lumbar paraspinals and other accessory muscles to hold yourself upright in extension, to the point of problems, and possibly pain. The previous two explanations of how posture can be affected into a predominantly extension based pattern involve longer durations, often years in the making of a posture. In this case, this can be one or two activities that can be considered the opposite of low load. 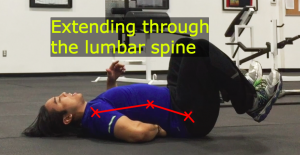 If you happen to sprint, throw, or land in an awkward position, but don’t fully “injure” yourself, the positioning may cause you to compensate by loading the spine into – you get it – an extension based pattern. While this last category can be grouped with the above category, this is often grouped in my head within the context of accidents or contact injuries. Where does this leave you, the client, athlete, or patient, when you’re experiencing lumbar spine discomfort (or perhaps pain)? I don’t claim that the following will fix pain, but perhaps set a better window of opportunity for mechanical tension to be relieved at the facet joints of the spinal vertebrae. 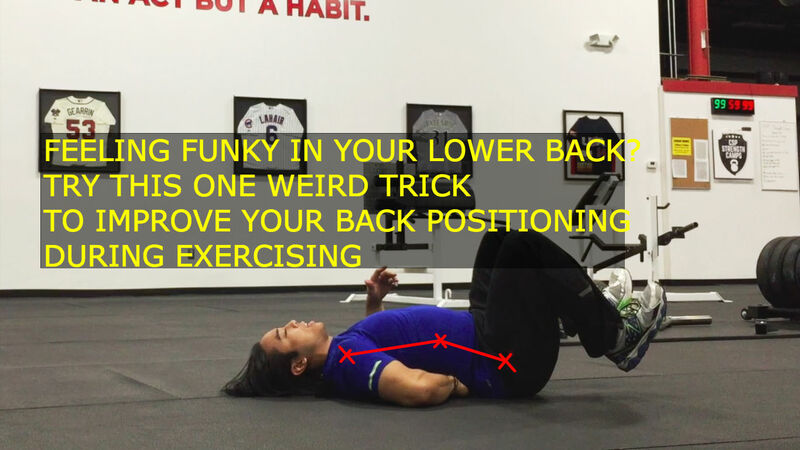 Unfortunately, even a simple exercise like the dead bug can be performed with extension through your lower back. So, here is how your spine is structured, because without understanding this, you might not understand how to function. Your spine is theoretically “stacked” on top of each other. However, during an extension based dominant pattern, the posterior “thing” poking out (aka your facet joint) is touching possibly both the top and bottom of the other spinal vertebrae. 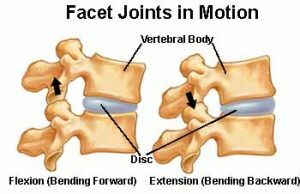 We can call this “approximation” of the facet joint, which is supportive of an extension based pattern. When the facet joints move slightly away from each other, and the posterior “things” move slightly more and more away from each other, this could be called a “distraction” away from the “approximation” … which speaks about restoring flexion away from an extension based pattern. With all of this said, here is a video detailing the simple and actionable terms of how to improve positioning of your lumbar spine. Now, this isn’t “pulling” directly, which is something you can achieve through an external force (such as physical therapist performing a lumbar spine or hip distraction), but this can set the stage for better proprioception, control, and muscular stability in an otherwise unstable environment. When these patterns are present long enough or with enough load then painful patterns may arise, two of which are flexion intolerant low back pain and sciatica. Next time perhaps we can go over how to improve upon your positioning in a standing and even dynamic nature!